I think that what Mr Karl-Heinz Fink first said to me, having asked for tea and sitting down after we hugged and greeted each other, was: “We have a common friend – Dirk”. He was talking about Dirk Sommer, the editor-in-chief of the hifistatement.net magazine that we have been collaborating with, a member of the Krakow Sonic Society and sound engineer, mastering specialist and owner of a vinyl record label (more HERE and HERE). 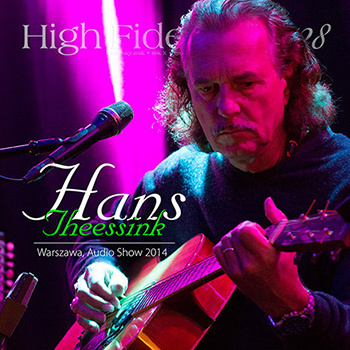 It turned out that the owner of Fink Audio-Consulting used to write for hifistatement.net, as well as produced, together with Dirk, an album containing a recording of Hans Theessink’s concert entitled Live at Jazzland (Sommelier Du Son sds 0016-1, 180 g LP, 2014). The memory triggered off a whole bunch of associations – in 2014, Hans Theessink visited “High Fidelity” and gave a fantastic concert during the Audio Show 2014 exhibition. Another common friend of ours, Matthieau Lattour, the CEO of the Nagra company, also released his album with Dirk – it was a “live” recording, this time one of Leon Russel from the Montreaux Jazz Festival in 2011. Naturally, the concert was recorded on the Nagra T tape recorder (Edel: Content 0208394CTT, “Triple A Series”, 180 g LP, 2013; a coverage of the visit at the seat of the Nagra company can be found HERE). It demonstrates that, in the audio world, people with similar tastes, beliefs, sensitivity, etc. join together to form different constellations, a bit like crews forming jazz bands, often for the purpose of recording one album only. You may have already noticed that Mr Karl-Heiz is a versatile person with a lot of interests. On the one hand, he knows Dirk through his birthplace – Bohum and, on the other hand, thanks to the fact that he used to write for German audio magazines, mainly for “Stereo”. When he was a teenager, he constructed loudspeakers and sold some of them to his acquaintances. Untypically for a German person, his point of reference were British constructions, including ones manufactured by the Harbeth company. But, as he adds, his mentor was Ted Jordan, the owner of the ALR/Jordan company, i.e. a German firm (one from Essen – the city where the seat of the Fink Audio-Consulting company is located). Quite early, he started working as a consultant. It is a profession known in every field, including the audio domain. A large company hires someone to carry out a single project which it then sells under its own name. The name of such a consultant is usually given (see the fashion industry) but equally often nothing is said about him or her. As it seems, the aim is for the company not to tarnish its image. It is assumed in specialized fields that the manufacturer is also the originator and that they actually carry out the project. If they need some outside help, it means that they are “not coping well”. Reality is a bit more complex. That is why Mr Karl-Heinz Fink and his Fink Audio-Consulting company are one of the most (un)known chapters in the history of audio. It is because the designs of many important series of loudspeaker columns, mainly for British, German and Japanese companies, come from Essen. 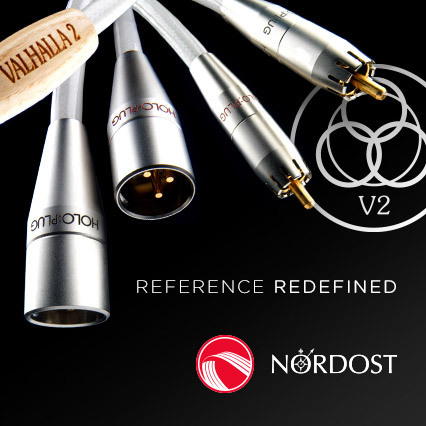 Among others, firms such as Tannoy, Yamaha, Q Acoustics, Boston Acoustics, Castle, Denon and Marantz have used the company’s services. One of the constructors that it employs is Mr Lampos Ferekidis, who once worked on the NXT project and whose experience proved valuable for the Ovator S-800 project (with an NXT panel) for the Naim company and, right afterwards, for the car-audio system for Bentley cars (by Naim). 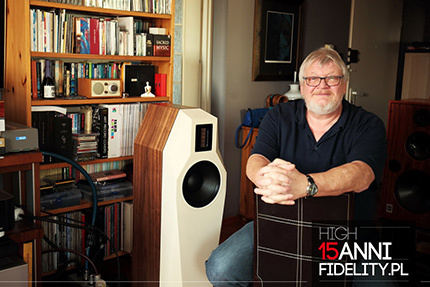 In 2016, Mr Karl-Heinz came out of the shadow, offering the enormous WM-3 loudspeakers. Their design included everything that the FinkTeam company, established for the purpose, had to offer. 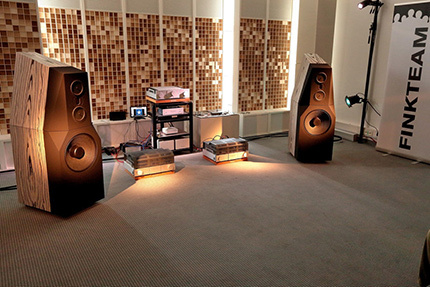 These were enormous, three-way, four-driver loudspeakers. The midrange/tweeter section had the form of D’Appolito arrangement, i.e. there were two midrange drivers on both sides of the tweeter. Below, there was an enormous 15-inch woofer. All of these drivers were very characteristic. The tweeter was an AMT driver based on Dr Oscar Heil’s patent. The midrange drivers had characteristic flat membranes – these were FMWD (Flat Membrane Wide Dispersion) drivers based on the NXT technology. The woofer resembled units used in Pro (stage) loudspeakers – it had a paper membrane, textile surround and concentric “circles”. A year later, during the High End 2017 exhibition in Munich, their development version, the WM-4 model was presented. We saw something equally exciting then – Mr Fink’s latest design, the Borg model. This loudspeaker is to include distilled WM-4 solutions in a much smaller form and at a more affordable price. The presentation attracted a lot of interest from the press and visitors. It was repeated during the Audio Video Show 2018 exhibition in Warsaw and it attracted the crème de la crème of the European (and not only European) audio press. There was everyone who has any significant importance in this world. The loudspeakers, with Thrax Audio electronics and the Kuzma Stabi R turntable delivered simply excellent sound. Let us add that it was also largely thanks to wonderful setup done by the RCM company - Mr Karl-Heinz couldn’t praise it enough. A natural consequence of such wonderful performance was the Best Sound • Audio Video Show 2018 award given by our magazine. The loudspeakers sounded very much like what I hear every day in my reference system. So, right after the exhibition, Mr Roger Adamek (the company’s distributor for Poland) and I arranged for their test that you will find in this issue of “High Fidelity” (HF | No. 178). In order to make everything go the way it should, we invited their constructor to Cracow. Making use of this opportunity, I asked him about a few things connected with the design of the Borg loudspeakers. You will find the interview below. KARL-HEINZ FINK is interviewed by Wojciech Pacuła accompanied by Roger Adamek, the owner of the RCM distribution company. WOJCIECH PACUŁA: When exactly were your companies founded? 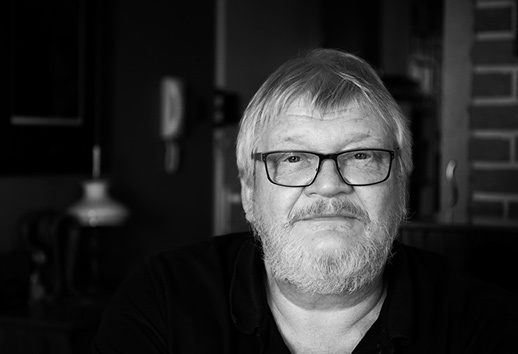 KARL-HEINZ FINK: Fink Audio-Consulting was established in 1986 and FinkTeam started three years ago, but we used its name for the first time two years ago. What was FinkTeam’s debut loudspeaker? Our first loudspeaker was the WM-3 model – something like a made-to-order loudspeaker for Ken Ishiwata, which was to accompany Marantz at the High End exhibition in Munich – and that was three years ago. A year later, we presented the WM-4 model and it was the first one with the FinkTeam logo. Which of the projects carried out for external companies has brought you the most satisfaction? I think that the Q-Acoustic Concept 500, as well as the NAIM Ovator S800 loudspeakers gave me a lot of fun. 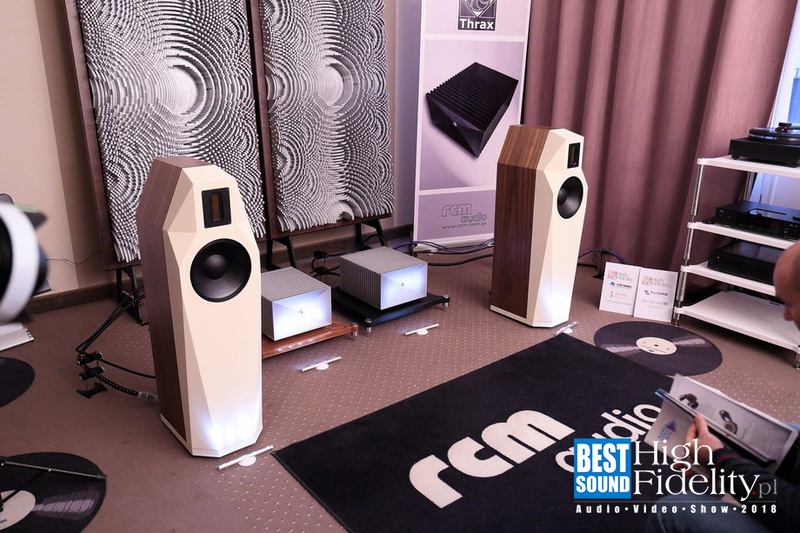 I’ve seen your presentation in Warsaw at the Audio Video Show 2018 exhibition and I was very impressed with your Borg loudspeakers. I was even more impressed because these are two-way speakers. And there are so many issues with two-way speakers having such a big woofer. How do you deal with them? The crossover is at 1,600 Hz and at this frequency the woofer works really well. To be honest, there were more problems with the tweeter. We needed some time to ensure the desired Air Motion Transformer operational parameters at 1,600 Hz. The woofer itself runs flat at 2.3 KHz. But, again, the crossover is set at 1,600 Hz and if you measure out of axis, you can see that the whole response slowly goes down there. It is sensible to design a loudspeaker to go a little bit down out of axis. And if you compare this loudspeaker with one having a conventional 25 mm dome tweeter, for example, you can see that frequency response at the crossover point in the conventional one first goes down a little, then goes up and remains higher, and then goes down again. 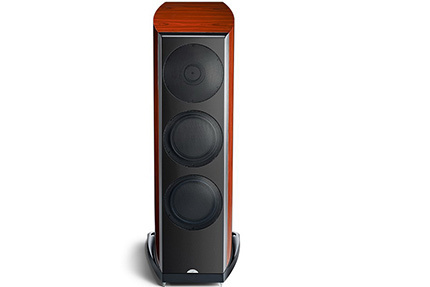 The overall curve measured for our loudspeakers is a slightly falling one. That makes them it a bit easier to use in different listening rooms. The woofer seems to be a very conventional one, like one from the 1960s or 70s. You’re talking about the corrugated speaker surround, aren’t you? I like this kind of surround because it doesn’t have the hysteresis that you get with typical rubber surround. I am not saying you can have every single loudspeaker with this kind of surround, but it is an important design element of both this and our bigger model. There’s a difference in the way we make the surround stiff. So, in the conventional model you have a very loose surround and a relatively stiff (invisible – Editor’s note) spider. Our loudspeaker surrounds have similar stiffness, so they can be better controlled.